We are going to start our first round of buying aimed at the strongest names in the portfolio. We are adding to the S&P 500 (UPRO), MOS, and would like to add to VMW but we should not get too aggressive today until we see clarity. We cannot buy everything in sight just because we got pull backs to a major support area (all of our names did today). So we are choosing carefully. By the way, the $ dollar (UUP) usually has an inverse relationship to the market S&P 500(UPRO). UUP looks like it is breaking out- not a good sign for the market. But I have seen both move in tandem at times so this rule is not set in stone. We really like the setup in MOS. There is a bull flag forming (see education: chart patterns) in MOS and it is above all moving averages with strong volume plus we like the current catalysts- see post 42 and 43. We added to UPRO as well because it is forming a doji on the 50 day (green line). A doji indicates indecision (see education: chart patterns), and the UUP is breaking out- so this is not the greatest backdrop for buying stocks. However a pullback to the 50 day for UPRO combined with the fact that UPRO is making slightly higher highs and lows is bullish so we are buying regardless of how bad Europe seems. 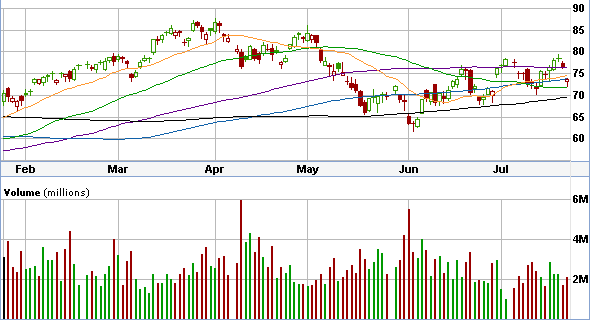 The stop-loss will go in below the 50 day moving average at $72.00. We set our prices and are sticking to them. However, if the velocity of the drop accelerates, then we will re-evaluate our price targets for buying.